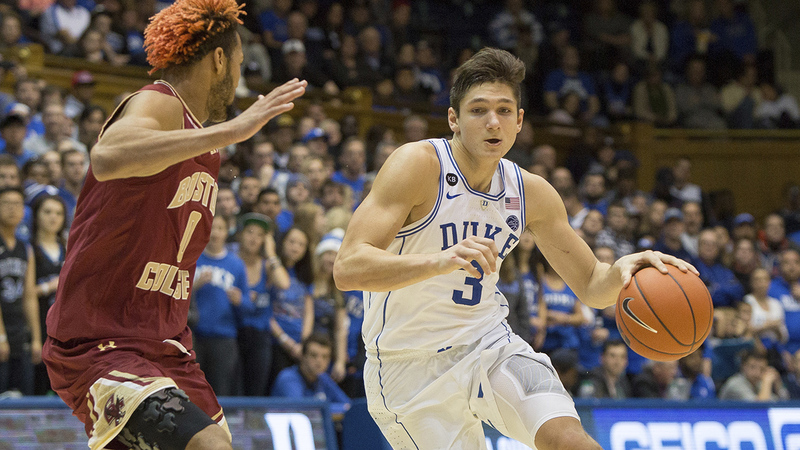 DURHAM -- Duke Blue Devils star Grayson Allen has played only two games since his indefinite suspension for tripping an opponent earlier this season, but he's already under scrutiny again. Following No. 8 Duke's 93-82 win over Boston College on Saturday, the ACC released a statement saying "there is nothing conclusive that can be determined" as to whether Allen intentionally made contact with an Eagles player using his leg or foot. The play in question occurred in the first half, when Allen extended his left leg while trying to fight through a screen set by Boston College's Connar Tava. No call was made during the game, so no further action is expected from the ACC. The Blue Devils stripped Allen, a junior, of his captaincy and gave him an indefinite suspension that amounted to one game after he appeared to intentionally trip an Elon player in a Dec. 21 game. That marked the third time Allen had been accused of tripping an opposing player in a game in the past two seasons. Allen, who started Saturday's game, finished with 12 points, five rebounds, 11 assists and three steals while playing a game-high 37 minutes. Duke next plays Tuesday at No. 12 Florida State.